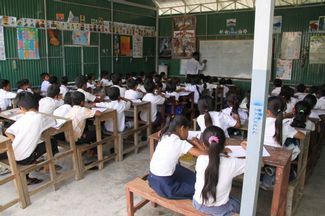 A fund-raising lunch will be held next week to raise money for a Cambodian school in Tanop Village. A FUND-RAISER will be held next weekend to benefit a school in Tanop Village, Cambodia. Funds raised will go towards the building of a library. Two years ago Toowoomba woman Lyn Hotchin visited Cambodia and was inspired to build a school. “Many People from Toowoomba and south-east Queensland have visited the school in the last two years and helped with teaching and medical assistance for the children and their families,” Mrs Hotchin said. “The ripple effect of this school in the community has been unbelievable. through fund-raisers and generous donations of many local groups. The fund-raising luncheon will be held on Sunday, March 27 from 11am at Angelo’s House. Tickets are $49 each or $450 for a table of 10. Contact Frances Holmes on 461 34000 or email frances@eventmanagement.com.au to secure tickets.